Whatcom County Residents are invited to the Oil Train Impacts Public Forum, hosted by ForestEthics and RE Sources for Sustainable Communities, will be held at the Bellingham Public Library, 210 Central Avenue on Thursday, July 9, 7:00 – 8:30 p.m. The general public is invited to attend this presentation free of charge. Speakers will give brief presentations followed by discussion and questions from the audience, including topics regarding emergency response times, safety of schools and housing, potential harm to rivers and farms, prevention of tanker explosions and more. 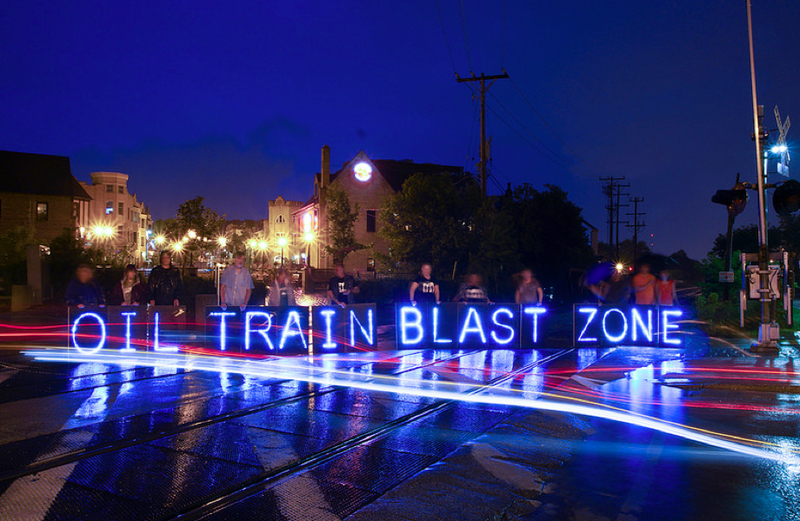 This event is part of a national week of action commemorating the 47 people who lost their lives on July 6, 2013, in an oil train explosion in Lac-Megantic, Quebec. Since the oil industry is moving millions of gallons of highly toxic, potentially explosive crude oil through Washington in unsafe rail cars over tracks that were never designed for this dangerous cargo, we continue to face the threat of a similar accident. Numerous proposals are pending that will increase this risky traffic to a number of locations around Washington. For more information, contact Alex Ramel. This entry was posted in Event, Facebook Post, Information and tagged Bellingham, Blast zone, Forest Ethics, Oil trains, Public Forum, RE Sources. Bookmark the permalink.